Dialogue should be integrated into the article for better flow. Jiub is a Dunmer scout whose soul is trapped in the Soul Cairn. He prefers his long title, Saint Jiub the Eradicator of the Winged Menace, which he received after he eradicated Cliff Racers from Vvardenfell. He recognizes that he died in Kvatch at the start of the Oblivion Crisis, though he does not seem aware that he has been gone for more than two hundred years. He searches the Soul Cairn for the pages of his Opus, a book in a line of 26 volumes. He wears a pair of ragged trousers and carries a steel dagger. To find him, stand in the gap by the wall dividing Soul Cairn. Enter the side with the Boneyard and immediately head east. Follow the trail of soul pits until you come to a large soul pit with some loot and page 5 of Jiub's Opus. Jiub will be nearby, sitting at a campfire. 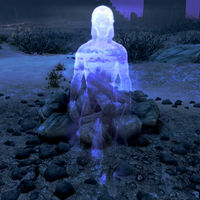 If pressed for information on how he came to be in the Soul Cairn, Jiub will reveal that he was soul trapped and killed by a Dremora during the siege of Kvatch. Jiub may greet you by saying: "I'm still hard at work on the second volume of my epic." or "Come to visit this lost soul again?" or "Back to visit Jiub the Magnificent, eh?" or "I hope you've read the first volume of my epic by now." or "I miss my homeland, but I can't say that I miss all the noise!" When exiting conversation with Jiub, he may say: "When you get back to Tamriel, let them know I still exist." or "Now, where was I..." or "Only thirty more pages and my next volume will be complete." or "If you think of any juicy details to add to my work, let me know!" How'd you get caught? "I finally bit off more than I could chew. I was paid to assassinate some high-ranked official from House Redoran. What I didn't know is someone had hired the Morag Tong to kill him as well." Rival assassin? "Exactly. He got to my target first and called the guard to cover his tracks. By the time I got there, the place was on alert. Walked right into a trap, and didn't even realize it until I was captured." You said you were in prison? "That was a dark time in my life. I did a lot of things I ended up regretting. Maybe that's why I worked so hard to redeem myself once I was freed." Is that where you were attacked? "Indeed! One moment I was writing diligently, and the next, my door bursts open. It was a cadre of dremora. The city was under attack. I took it upon myself to join the cause and fight the dremora, thinking this would simply be another feather in my cap." What did you do? "I murdered others for money. And before you think I belonged to some romantic or secretive guild, think again. I was simply an addict who needed money for skooma. The stuff wasn't cheap, and murder always seemed to be in demand." What ended up happening? "Well, I don't know. Everything seemed fine until that dremora attacked me. I only heard later about the gates from the other souls. I can only assume the gates have been closed by now." Where were you captured? "I had just moved from my ancestral home in Morrowind to the continent [sic] of Cyrodiil. I settled in the city of Kvatch to write my memoirs and to find some peace and quiet." Why was Dagon able to do this? "All I heard is that without a Septim sitting on the throne of the Empire, the Dragonfires in a place called the Temple of the One were no longer lit. This meant that we were vulnerable to the forces of Oblivion." Why would a dremora attack you? "Well, that's a ridiculous question. Everyone travelling through here has said that the Oblivion Gates have been opening all over Tamriel." How did you earn your nicknames? "Ah, yes. Saint Jiub, Jiub the Eradicator, Jiub the Magnificent... I've earned a lot of titles thanks to my campaign against the Winged Menace." What was your campaign against them? "After I was freed from prison, I decided to turn my life around. Give something to the people of Morrowind. It became quickly apparent that the best way I could help would be by wiping out the cliff racers." Winged Menace? "Yes. I'm speaking of the Cliff Racer of course. Wretched things. They use to criss-cross the skies over Morrowind like vermin. Nasty flying creatures with a habit of sneaking up on the unwary." "Now what was it I said to that prisoner? 'Stand up, there you go. You were dreaming...' Yes, that was it." "Did I start with my ride on the prison ship, or was it before that?" "Was it 'Between forces of good and evil.'? No, no...that's not it..."
"Was it 'Having the adoration of thousands...' No, wait. I could make it 'the adoration of tens of thousands.'" "I wonder how many copies I'll sell? Hundreds? Thousands? I'll hire the finest bookbinder I can find." "'And without any regard for my safety, I fearlessly charged the enemy!' No, much too dramatic..."
"When I rewrite those pages...they'll see what they missed." "Damn it. How could I be so foolish." "'Savior of Morrowind.' Hm, that's good but it sounds too narrow of scope..."
"I can't believe I lost those pages." "Hm, Did I call it 'The Great Hunt' or was it just 'The Hunt?' Bah, I can't remember!" "I miss my homeland, but I can't say that I miss all the noise!" Jiub also appears in Morrowind, where he is the first NPC the player meets. Jiub is voiced by Jeff Baker, who also voiced Haskill in Shivering Isles and the male Dunmer (including Jiub) in Morrowind.